The example below explains how to build a single line diagram of the power distribution system using Short-Circuit-Analytic version 1.0 software program, perform short circuit analysis and document the results. This program, other programs, or hand calculations can be used to perform short circuit calculations. Any method used requires specific data on the power distribution system components. Check Equipment Data for Short Circuit Study page describing the data required by SCA V1.0 short circuit calculations software program for each type of circuit component and how to obtain the data. STEP 1: Develop Single Line Diagram and Populate it with the Equipment Data. Launch SCA V1.0. New project screen will open up. Figure 1. SCA V1.0 new project screen. Develop a comprehensive single-line radial diagram of the power system being analized. It is recommended that you use a copy of the same one-line diagram which is applied when laying out the distribution system. This approach provides the most complete system. Let's use a single line diagram represented on Figure 2 below for our example. The diagram below was created using free online diagram maker located at www.draw.io draw.io online is a free-to-license web application for everyone. It is free for any usage, there is no premium pay-for functionality, watermarking, etc. You own the content you produce and may use it for any purpose. You can store your draw.io projects in .xml format on your desktop, in Dropbox or Google Drive. Whichever storage option you select, when you start draw.io, you will always be presented with a screen asking whether you want to create a new file or open a new one. Although draw.io provides an extensive set of default libraries, there may be times when you would like to use symbols that are not provided. Provided you are able to locate and use the relevant symbols, you can incorporate them into a custom library, which can then be used in the same way as any of the existing default libraries. Check draw.io user manual and online tutorials for basic and advanced options. Figure 2. Sample single line diagram for short circuit analysis . Add components from Figure 2 above one by one to re-create the diagram in SCA V1.0 software. The program gives you the advantage of saving the entered system diagram. This is practical for systems with multiple scenarios of interconnections where the system goes through ongoing changes over a period of time. The single line diagram can be saved by clicking on Save, Save As options from the File menu, or pressing Save button on the program toolbar. Files for single line diagrams are saved with the *.sca file extension by default. Figure 3. 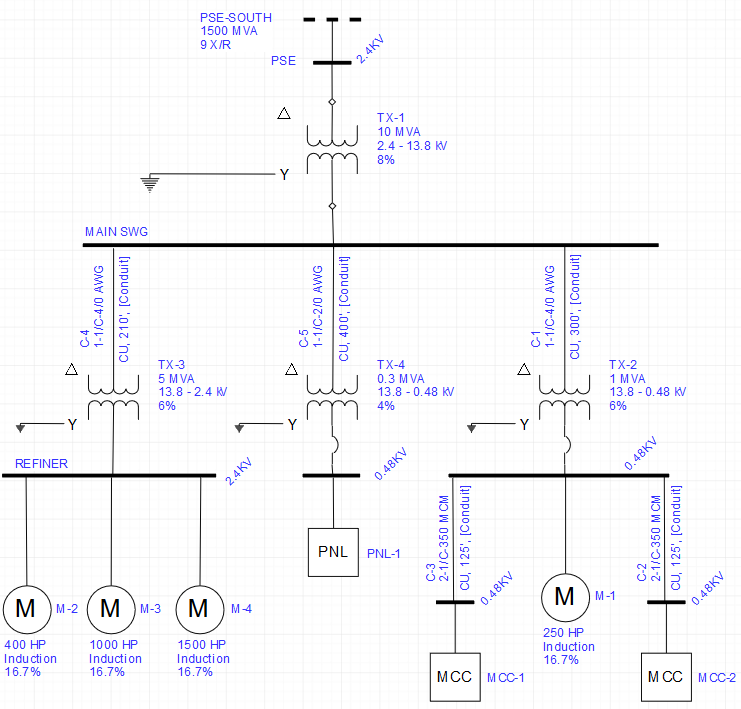 Completed single line diagram in SCA V1.0. To open a previously saved single line diagram, click on Open from the File menu or press File Open button on the program toolbar. A dialog box will appear which lists all the short-circuit (*.sca) files in the active directory. One of these can be selected or the directory/drive can be changed to list other short-circuit files. STEP 2: Run the Program and Observe the Results. The Short Circuit Analytic software program performs vector operations on the resistance and impedance values from power corporation, transformers, cables, generators, high voltage motors and low voltage motors. Accurate equipment X/R ratios should be used wherever available. Figure 4. SCA V1.0 calculation results screen. Note that the program calculates minimum and maximum available 3-phase short circuit currents at each bus within your power distribution system. You can also click on calculation results column headers to sort the data by the column title. Click on Save button to save calculation results in tabulated text format. Now you can open the report file in your favorite text editor (Notepad or MS Word for example) or data processor (MS Excel for example) and do what you need to do. To print single line diagram from SCA V1.0, select Print from File menu or press Print button on the program toolbar. You can adjust printing options and preview the output by clicking on Page Setup and Print Preview buttons on the toolbar.